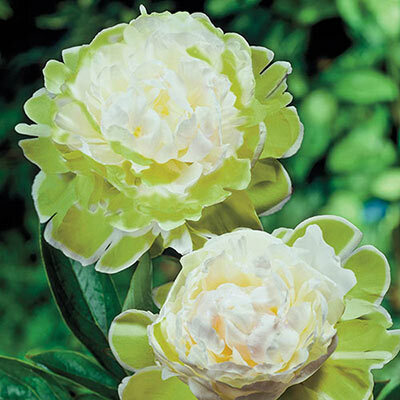 Highly sought-after peony with large, ball-shaped flowers that are 8" across. Tuft of white petals arise from a layer of green petals. Our double varieties are free blooming with flowers 5-7" across. Our anemone-flowering varieties have a different appearance with the same long-flowering performance as the double peonies. A single row of petals frames a fringelike stamen. During spring, they fill the garden with fragrance; long-lasting flowers, ideal for cutting. Suggest planting as yard dividers or in small groups in borders. They like rich soil, full sun and open areas. Extravagant, double, ball shaped 8'' blooms. Deeply incised and divided. Medium green in color. Dig a hole large enough to spread out roots without bending them. Set crown with buds 1" below ground-level. Water in thoroughly. Plant at least 6 weeks before ground freezes. Set crown with buds 1" below ground-level. Once or twice a year. Best in spring and summer. Peonies like fertile soil.